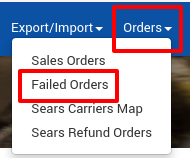 The BigCommerce store owner can view the list of failed Sears orders on the Failed Orders page. If the Ordered SKU is Out of Stock in the BigCommerce store. If the Ordered SKU is disabled in the BigCommerce store. If the Ordered SKU does not exist in the BigCommerce store or is deleted from the store after uploading to Sears. If the selected Payment Method in Sears Configuration Setting is not available in the BigCommerce store. Scroll down to the required failed order. In the respective row of the failed order, click the View icon. All the details of the failed order appear on this page. In the respective row of the failed order, click the Cancel icon. The failed order is canceled.